In Bangladesh, fish plays a central role in dietary patterns, livelihoods and culture. Fish is by far the most commonly consumed animal-source food across all population groups, at an average of 19.71 kg/person/year. Fish is an important diet staple, providing a rich source of micronutrients and accounting for 60% of animal protein intake. Research shows that increasing fish consumption and dietary diversity can affect significant developmental changes. 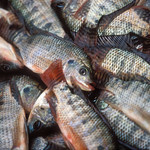 Both capture fisheries and aquaculture play significant roles in fish production and consumption in Bangladesh. Aquaculture currently produces more than 2 million metric tons per year, while small-scale fisheries production is around 1.54 million metric tons. There is great potential to substantially scale-up production with innovations such as community-based fisheries management, sustainable feeds and low carbon production systems. In 2014-15, 83,524 metric tons were exported, more than half of which were shrimp. 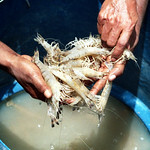 Around 18.2 million people are employed in fisheries and aquaculture. Since 1989, WorldFish has been working with the Bangladesh Government and development partners to create a more productive fisheries and aquaculture sector that contributes to diversified and resilient rural livelihoods and promotes food and nutrition security.